The number of personnel employed by OP Financial Group grew by 97 in 2016. At year-end, the Group employed 12,227 persons (12,130). 93 per cent (93) were permanently employed. 92 per cent (93) were full-time employees. Of Group employees, 11,787 (11,695) were based in Finland, 191 (191) in Estonia, 113 (112) in Latvia, 134 (130) in Lithuania and two in the St. Petersburg Representative Office in Russia. OP Financial Group has no actual business operations in Russia. In addition to its own employees, OP Financial Group employed 1,089 leased employees in development and service production tasks at the end of 2016. In 2016, OP Financial Group recruited 1,236 new employees (1,015). The annual turnover of permanent employees was 7.9 per cent (8.3). Voluntary staff turnover was 3.7 per cent (3.8). During the year, a total of 42 (243) employment relationships ended, 14 (63) for production-related reasons and 28 (180) through voluntary arrangements. There were no business transfers in 2016. In the summer of 2016, the Group employed a total of 492 summer employees, whose average age was 24.4 years. 56 per cent of the summer employees were women. In 2016, a total of 388 (241) employees retired at an average age of 61.7 years (61.5). In 2016, a total of 1,089 (1,112) people were on parental leave, 793 (812) of whom were women and 296 (300) men. 99 per cent (100) of men and 93 per cent (94) of the women whose parental leave ended in 2016 returned to work. The retention rate of those who had returned to work from parental leave in 2015 was 92 per cent (87) for men and 94 per cent (93) for women. The figures are for Finland, excluding the personnel of OP-Kiinteistökeskus. OP Financial Group performs all cooperation procedures in compliance with the Act on Co-operation within Undertakings and other local legislation governing such procedures. OP Financial Group has arranged cooperation with employees through a cooperation group that convenes on a quarterly basis. The group discusses OP Financial Group's finances and performance, along with other current matters concerning the entire Group. All Group companies have arranged their own cooperation procedures in accordance with legislation. OP Financial Group abides by local legislation in all its operations. In Finland, the main regulations concerning corporate reorganisations are found in the Act on Co-operation within Undertakings. According to the Act, in cases of business transfer, staff representatives must be given one week’s notice. Written proposals for personnel negotiations must be submitted to staff representatives five days prior to the start of negotiations. In Finland, 91 per cent (90) of OP Financial Group personnel are covered by universally binding collective labour agreements. No binding collective agreements exist in the sector in the Baltic region. At OP Financial Group, the percentage of the total workforce represented in health and safety committees is 88 per cent (87) of the entire Group personnel. The central cooperative has its own health and safety committee, and so do all banks with more than 20 employees. In 2016, sickness absences accounted for 3.5 per cent (3.5) of regular working hours. For men, the proportion of sick leaves was 1.8 per cent (1.8) and for women 4.1 per cent (4.1). Sickness absences have remained at the same level throughout the 2010s. The figures are for Finland, excluding the personnel of OP-Kiinteistökeskus. OP Financial Group is a unionised employer. The Group companies apply three collective labour agreements: the collective agreement for the finance industry in banking operations, the collective agreement for the insurance industry in insurance operations, and the collective agreement for the medical services industry at Pohjola Hospital. These agreements contain regulations on, for example, the implementation of cooperation in occupational safety and health matters and the status of industrial safety delegates and ensuring their operating conditions. As a large-scale employer, OP Financial Group plays a major role in developing the industry. OP offers all employee groups a variety of ways to develop their competencies. The basis for each employee’s individual development is to understand OP’s strategy and how OP’s strategic transformation will affect one’s own work and competence needs. Competence development involves the use of all applicable learning methods and opportunities as part of the employee’s work, either by providing new challenges and learning opportunities in their present work or by offering versatile career opportunities within the Group. New skills are learnt primarily through knowledge sharing and by deepening one’s understanding through various interactive situations and networks. In addition to these, OP invested approximately EUR 7 million in local employee training sessions and in video and online study solutions in 2016. The entire OP personnel in Finland and abroad have annual performance and career development reviews. The aim of OP Financial Group’s operating model for the management of employee wellbeing is to increasingly ensure, through close and well-organised management of occupational safety and health and wellbeing at work, the work ability of older employees and those at risk of work disability and the labour market competency of those at risk of unemployment. If there is no more work due to production-related and financial reasons and an employee becomes under the risk of unemployment, he or she has the opportunity to get a support package and coaching that supports his or her employment. Key employee wellbeing elements include the early support model, occupational health care, rehabilitation, flexibility at work and diversity management, among others. OP updated its operating models for employee wellbeing management in 2016. OP Financial Group implements its strategy and annual plan through regular employee performance reviews. They are an integral part of performance management and include the goal-setting review, performance review and competence and follow-up review. The first review of the year includes an assessment of the employee’s performance during the past period and setting targets for the coming period. The second review deals with competencies and the realisation of targets in the current period. The purpose of the competence review is to draw up a development plan on the key areas in need of improvement. OP Financial Group has two types of organisation-wide personnel surveys: an extensive Personnel Survey and a more fast-paced Personnel Pulse. The Personnel Survey is carried out every two years; the next survey will take place in 2017. The results of the 2015 Personnel Survey were good. According to the survey, OP’s key success factors are community spirit, value-based performance and customer focus. 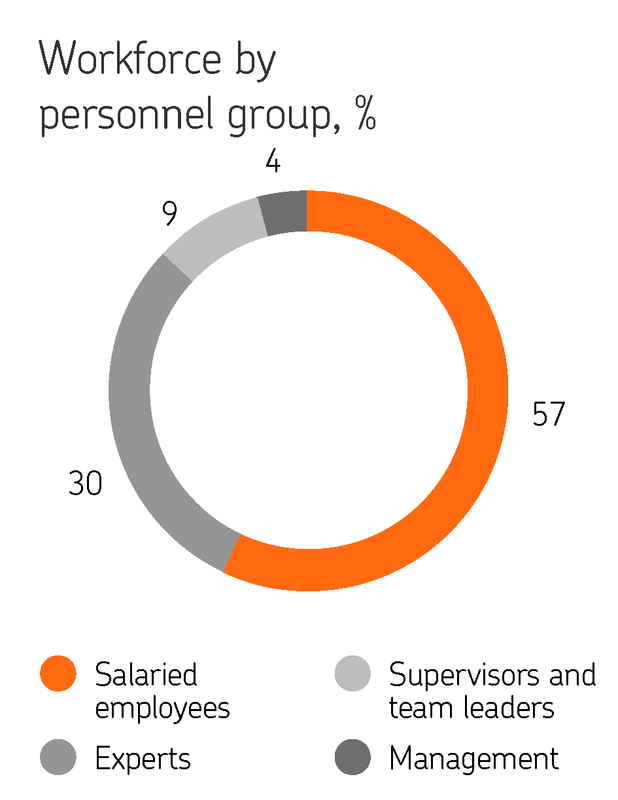 The structure and content of the Personnel Survey was revised in 2016. Of the members of OP Financial Group’s governing bodies, 64 per cent (64) were men and 36 per cent (36) women. At the end of 2016, the average age of these persons was 52.8 years (52.4). 31 per cent (33) of the members of the governing bodies were under 50 years old. OP wants to provide equal opportunities to all employees. At the end of 2016, 71 per cent (72) of OP Financial Group’s personnel was women and 29 per cent (28) men. The average age of personnel was 43.6 years (43.8) with an average employment time of 14.0 years (14.4). No new cases of discrimination were reported through the Non-Discrimination and Equality Board, or through HR or any audits. A claim made in 2014 against OP Financial Group about discrimination was appealed to the Administrative Court of Helsinki. According to the Administrative Court’s decision, no discrimination was involved in the case in question. OP Financial Group’s service network comprises branch, online, telephone and mobile services. The Group provides personal customer service both at branches and digitally. OP has Finland's largest network of banking and non-life insurance services. This network seeks to ensure that customers have equal opportunities to carry out transactions. Our cooperative banks and their offices across Finland enable effective interaction with customers and the local community. At the end of 2016, the Group’s member banks had approximately 469 branches as well as some 1,376 Otto ATMs (shared between Finland’s banks) around the country. In December, OP-mobile was the main channel for customers' daily banking, with visits totalling over 13 million during one month. The number of visits to op.fi amounted to almost 10 million. In March 2016, the number of OP-mobile visits exceeded that of op.fi visits for the first time. We provide comprehensive services in Finnish and Swedish, but among corporate customers as well as in growth centres and the Helsinki Metropolitan Area in particular, there is a great demand for services in English. For our English-speaking customers, we provide electronic services (op.fi, OP-mobile and Pivo) for carrying out their daily transactions for banking and insurance. With respect to other services, we develop our service capabilities in English in line with customer needs. Some OP-Kiinteistökeskus branches also offer service in Russian. In the Baltic countries, our branches serve customers in local languages, while our electronic services are available in English. The text version of op.fi website (pda.op.fi) is widely used by people with vision impairments, enabling the use of disability aids such as a speech synthesizer. Customers can log in to OP-mobile using fingerprint authentication. Furthermore, OP provides key code lists in Braille, enabling the use of the eService. The organisations of OP Financial Group apply a guideline entitled Procedures for Managing Operational Risk. The Central Cooperative formulates a risk analysis plan indicating which entities are to be analysed. If necessary, the entities to be analysed can be agreed with the Group’s member organisations. OP Financial Group annually carries out risk assessments which also cover risks related to corruption. Owing to a system update performed, part of these risk assessments will be completed in the first half of 2017. The Group’s member organisations update their operational risk analyses annually based on the procedural guidelines. The risk analyses are based on the organisations’ self-evaluations concerning operational risks and their management. 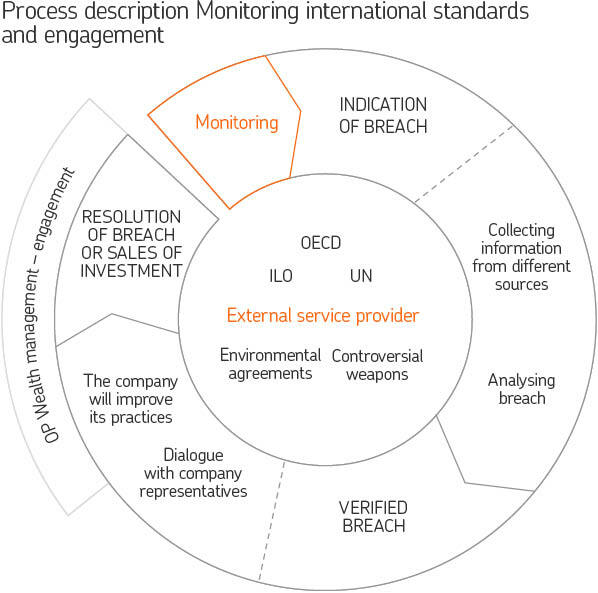 In line with the analysis process, each organisation identifies and evaluates the most important risks affecting its operations. To assist in identification, the Group has a shared risk library which lists diverse risks subdivided into seven risk categories. The Internal Abuse category includes the risk ‘Giving and Receiving Bribes’. Bribery has not been a significant risk in any of the risk assessments. The Code of Business Ethics document ratified by the Supervisory Board of OP Cooperative specifies that employees shall avoid any situation that may put them or OP Financial Group under suspicion of bribery. A compulsory online course for all employees of the Group was implemented to ensure familiarisation with the Code at all levels.By the end of 2016, the course had been taken by 100% (80) of the personnel. The guideline for Handling Conflicts of Interest in OP Financial Group is intended to prevent cases of corruption. All of the Group’s member organisations are responsible for applying the guidelines internally. Each and every executive and employee within the institutions must know the guidelines. Every manager is in charge of supervising compliance with the guidelines, with the CEO and board of each organisation having ultimate responsibility. The guidelines concerning conflicts of interests must be handled by each organisation and its employees on a regular basis, and whenever a new person receives job orientation. OP has no pending legal actions related to anti-competitive behaviour, anti-trust or monopoly practices. Late in 2015, OP was requested to respond to allegations that it was engaged in monopoly practices. According to a competitor, OP has a monopoly position in retail banking services and is abusing this position by combining retail banking services with non-life insurance services. OP has also been claimed to offer non-life insurance services below production costs. This case is still under investigation, and OP wants to cooperate with the Finnish Competition and Consumer Authority and provide them with any information they may need. OP Financial Group complies with legislation which requires that customers be informed of certain terms, properties or risks related to a product or service. This notification obligation applies to all three business areas of the Group: banking, non-life insurance and asset management. On 13 June 2016, the Financial Supervisory Authority gave OP Helsinki a public warning concerning the misleading marketing of the Customer-owner Deposit Account. There were six cases of error in data processing or storage and five cases of error in the processing of customer data. OP Fund Management implements its ownership policy by actively participating in the general meetings of companies listed in Finland, in particular. 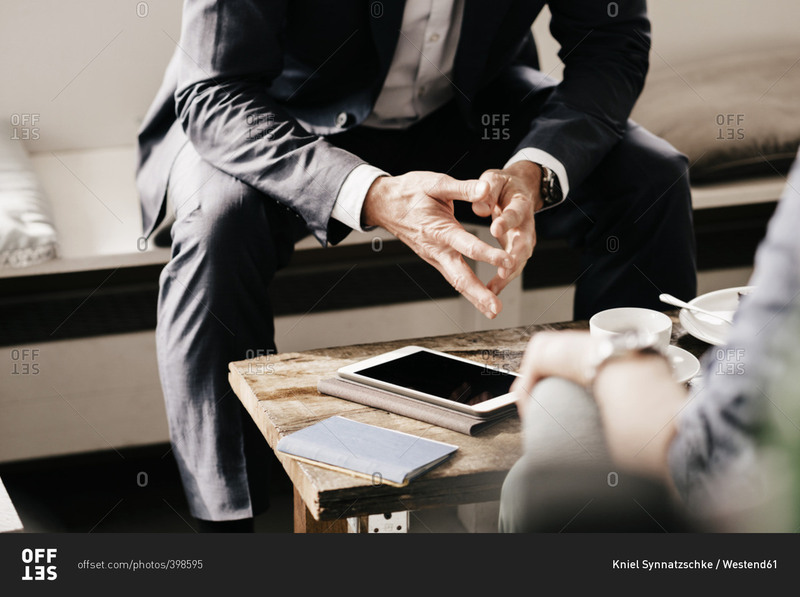 One of the most important ways for OP to obtain information on and assess the responsibility of companies to invest in, are meetings with the companies’ executives. At year-end 2016, the OP funds managed by OP Asset Management contained shares from 70 companies listed in Finland. OP Asset Management discussed environmental and social responsibility issues with 17 per cent of these during the year. OP also has other ways of influencing companies. If their investments include companies with violations of international standards or other operations which are not responsible or in line with the investor’s long-term interests, OP will influence them to address the situation. If this does not produce the desired effect, the Committee for Responsible Investment may decide to sell the investment. OP Financial Group encourages its investees and partners to operate responsibly and in line with international standards. Primarily, the most attractive investment targets in any fund are issuers whose operations are irreproachable in relation to international ethical standards. Positive screening is particularly visible in the OP Climate, OP Clean Water and OP Low-carbon World funds. The OP Climate Fund portfolio includes companies that will be in a good position when societies and businesses adapt their energy solutions and use of materials towards lower-carbon alternatives. OP Clean Water, in turn, invests in companies operating sustainably in the water resource management field, especially within development of water-saving technology, water treatment and construction of reliable water infrastructures. OP Low-carbon World Fund invests in companies which stand out from the competition on the basis of lower carbon intensity. At the end of 2016, the total value of these funds was EUR 313 million or 4.2 per cent of OP Fund Management’s equity fund capital. OP actively monitors the fulfilment of international standards by investment targets in line with OP Asset Management’s Principles for Responsible Investment, both when making the investment decision and during the time of ownership. Investment vehicles are screened for violations of international standards. Furthermore, OP ensures that its portfolios do not include manufacturers, sellers or marketers of weapons (anti-personnel mines, cluster and nuclear weapons) banned by certain treaties. This screening is performed biannually by an external analysis company. The screening applies to all active OP equity funds and corporate bond funds that make direct investments as well as discretionary client portfolios that make the above-mentioned investments. In 2016, OP excluded dozens of high-carbon companies from the above-mentioned funds and client portfolios. This applies to, for example, coal mining companies that make more than 25% or their net sales from energy coal production, and to electricity producers that use plenty of coal to produce electricity. A high-carbon company can avoid exclusion if it takes measures or has a plan in place to considerably reduce its coal dependency. A list of the excluded companies is available on OP’s website. In 2016, OP Fund Management introduced the OP-Sustainable World balanced fund. The fund applies negative screening to various products and functions. For example, the fund does not invest in tobacco or alcohol manufacturers. At the end of 2016, capital invested in the fund totalled EUR 35.7 million.